125 by Usman Khawaja, plus 59 by Chris Cooke - who shared a century stand for the fifth wicket - saw Glamorgan to 323 on the third day of their Specsavers County Championship match against Warwickshire at Edgbaston. This gave the Welsh county a lead of 293 runs over the team currently on top of the Division Two table, and by the close Warwickshire were 25/0. Cooke was unbeaten on 53 with his side leading by 243 when play resumed after tea but the complexion of the game changed as Warwickshire took the new ball at the start of the session, with Keith Barker and Henry Brookes returning to the attack. The latter, after a couple of abortive appeals, ended Cooke’s tenure of the crease as he shouldered arms to the young seamer only to edge the ball into Ambrose’s gloves. 284/6 then became 284/7 as David Lloyd departed l.b.w.to Barker. Ruaidhri Smith then got the scoreboard moving by swatting Barker over point for four and then scampering a series of singles with Andrew Salter as Glamorgan reached the 300-mark in the 91st over. Smith then clipped both Brookes and Chris Wright to fine-leg for four, but with the total on 312 he edged to second slip as attempted to drive Wright. Timm van der Gugten then nurdled Brookes for three but Patel returned at the Pavilion End and after some abortive appeals, he had one upheld for l.b.w against Salter. With the total on 322, Glamorgan’s last pair came together, but only one more was added before Carey edged Wright to second slip where Sibley took a good low catch as five wickets tumbled for 50 runs in 16.5 overs after tea. There were thirteen overs remaining as Carey opened the bowling from the City End with van der Gugten operating at the Pavilion End. Sibley on-drove the Dutchman’s second ball through mid-on for four before clipping Carey to square-leg for another boundary. Rhodes also pulled van der Gugten for four before doing the same to Carey, followed by a rasping straight drive before defending stoutly as Salter had a short spell at the Pavilion End. Glamorgan began the afternoon session on 145/4 and with a lead of 115 which Chris Cooke soon extended as he struck the first boundary of the session driving Keith Barker through the covers. Khawaja then unfurled another wristy drive as he steered Henry Brookes through point, followed later in the over by a nurdle to third man. The pair also accumulated in swiftly run singles as they further extended the lead before Warwickshire returned to spin at the City End with Josh Poysden’s leg-spin. Khawaja responded by reverse-sweeping him for four whilst Cooke pulled Chris Wright for four before lofting Poysden straight for four. Khawaja then cover drove Wright for four before Cooke dispatched a full toss from Poysden through extra cover as Glamorgan reached the 200-mark in the 60th over. Khawaja moved closer to his century as he off-drove Wright with aplomb before pulling Poysden. He then reached three figures by sweeping Poysden for four thereby emulating the feats of compatriot Shaun Marsh earlier in the season who also posted a century in his first Championship appearance for the Welsh county , albeit in his maiden innings. Having reached his sublime century from 121 balls with fourteen fours he added another next over by again reverse-sweeping the leg-spinner as Glamorgan’s lead topped the 200-mark. Khawaja then lofted Patel straight for six before a rare false stroke as he edged the Kiwi to third man to bring up the century stand. Cooke also late cut Patel for four before edging Will Rhodes through the slips, but with the total on 259, Khawaja’s innings was ended as he played back to Patel and departed l.b.w. David Lloyd duly joined his captain and off-drove Rhodes for four, before Cooke completed his patient half-century from 117 balls by flicking Rhodes to square-leg. Only two of the current Glamorgan team were alive when the Welsh county last won a County Championship match at Edgbaston. On that day on September 2nd 1988, captain Chris Cooke was still in his nappies in South Africa whilst Usman Khawaja was in Pakistan, prior to his family’s move to Australia. Yet both could help emulate the achievements of Alan Butcher’s team who thirty years ago defeated Warwickshire by just four runs with Greg Thomas having a fine all-round game scoring 110 and taking 6/70, whilst Steve Watkin returned career-best figures of 8/59 in the home team’s first innings. Yesterday, Glamorgan showed great tenacity in the field as they steadily whittled away at the Warwickshire batting with Andrew Salter during a frugal spell also stifling their batsmen, besides producing some razor-sharp fielding. Despite a century from Ian Bell, who also shared a stubborn eighth wicket stand of 67 with Chris Wright, the visitors kept their belief with the smart runout of Jonathan Trott and the stunning one-handed catch at second slip by Nick Selman to remove Tim Ambrose being emblematic of their collective sense of purpose. The net result is that Glamorgan started the day on 55/0 with a lead of 30, with Nick Selman and Jack Murphy facing the seam bowling of Keith Barker and Chris Wright. Murphy began with a glance to fine-leg against Barker whilst Selman clipped Wright to deep square-leg. But with the total on 64, Selman chipped a ball from Barker into the hands of short mid-wicket, 64/1 then became 67/2 as Connor Brown edged Wright into Ambrose’s gloves. Khawaja began with a pair of wristy square drives for three before nonchalantly flicking a non-ball from Barker to fine-leg followed by a booming off-drive for four. Jeetan Patel and Henry Brookes then entered the attack with the latter removing Murphy in his opening over as he yorked the tall opener for 25. Khawaja brought up the hundred by cover-driving successive balls from Brookes to the ropes before Owen Morgan nurdled Patel for four. 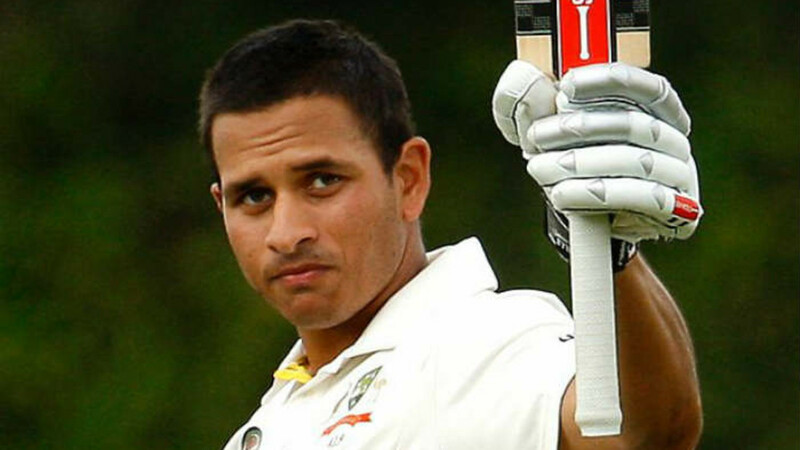 Khawaja then lofted Patel for four to long-on before working the spinner for one’s and two’s to complete a 58-ball fifty and take the lead into three figures. He then gracefully drove Patel through cover for another four before sweeping Josh Poysden when the wrist spinner made an appearance shortly before lunch. But it was the return of Brookes for the penultimate over of the session which ended the gritty innings of Morgan as an appeal for l.b.w. was upheld by the umpire. Previous News Article Reaction: "I felt good from the start"